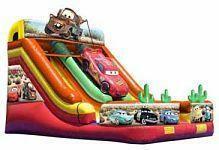 This unit brings fans from Carburetor County running with a whimsical design and exciting two-slide option. Kids can climb up the center tunnel, which is topped off by a three-dimensional Lightening McQueen, and then choose from either a right- or left- sided slide for a speedy ride to the cushioned bottom. Mater, the fun-loving truck sits in artwork atop the dual-lane slide.